We take weddings, marriage preparation, and marriage support very seriously here at the mother church. 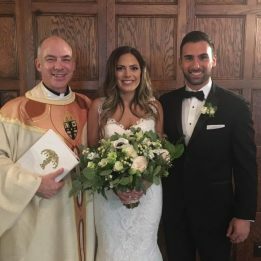 If you are looking for a beautiful and meaningful site for a Catholic wedding, please visit our Weddings pages to learn more. It’s Mission of renewal in the church and change in the world is to assist couples to live a fully intimate, responsible relationship. Expressed in the tradition and understanding of the Catholic church, the weekend is designed to help married couples communicate more intimately with one another and deepen and enrich their relationship, all in a private, confidential environment. The Worldwide Marriage Encounter website has more information. “Retrouvaille, a French word meaning “rediscovery”, helps couples put the pieces back together and rebuild loving relationships. If there is little or no meaningful communication in your marriage or if you are considering separation or divorce, we believe Retrouvaille can help you.” For further information, call 800-470-2230 (Michigan) or visit the website. For current class information, please visit the website or contact the Archdiocese of Detroit NFP office at 313-237-4679.